The art of bronzing precious things that a person wants to keep for decades is no longer a thing from the past that our grandparents in the past did with their keepsakes. That is because more people have grown to enjoy the idea of having items in their home that remind them of special moments in time that they once shared with a loved one. Which is why nowadays when you enter someone’s home you may see more than just bronze shoes on display of someone’s baby that is now grown up. In fact, many people now have a shrine to the special events that mattered the most to them in their lives. Which is why upon entering someone’s home there may also be other bronzed items like awards, shirts and hats displayed for other’s to see. The art of bronzing has been taken to a level that no one could have foreseen creating a customer base from varying backgrounds. Gone are the days of bronzing companies only receiving requests for baby shoe bronzing. Nowadays, people want their precious items encrusted in not only the antique and pewter color bronze but there are some customers who prefer their keepsakes to have 24 carat gold or a silver finish. Which ever way a customer see’s fit to keep their treasured items preserved the art of bronzing is the perfect way to keep their items from quickly deteriorating. Which is why the new custom clientele services that are now offered for bronzing come in different forms so that the customer can display their bronzed item to their satisfaction. Since not everything that will be bronzed is able to stand without assistance, there are different styles of stands that the item can be attached to so that bronzed item will be immovable. This is a great option for many customers who may not have thought about how they will keep their item elevated high enough for other’s to see it on display. By offering a variety of ways to encrust someone’s precious memorabilia customer’s are more enthused to have items displayed that remind them of not only their past experiences but loved one’s who have died. 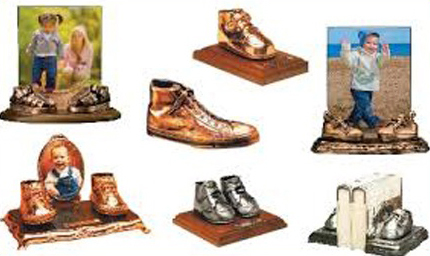 The art of bronzing has grown rapidly and without ceasing has turned into the new way for putting keepsakes on display. This entry was posted in Accessories and tagged shoe bronzing, what is the art of shoe bronzing on June 14, 2013 by Yami.